And here you have it - spring in an upturned flowerpot! What I love about this hat is the top. Biscotte & Cie's colours are even more rich in the tight texture of rice stitch gone circular. Happy Valentine's Day! And now I'll get back to my knitting. Update: another view of the hat, from Louise at Biscotte & Cie. I think the ladybug buttons make it, don't you? 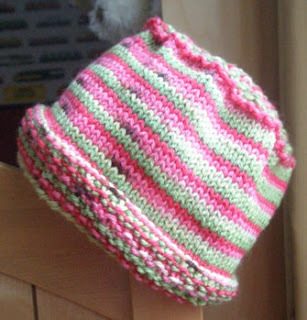 View .pdf of Flower Pot Hat. OH MY GOD !!! This hat is gorgeous !!!!!!!! Beautiful !! 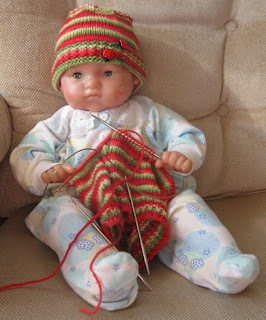 Biscotte's yarns are amazing and your pattern very lovely ! 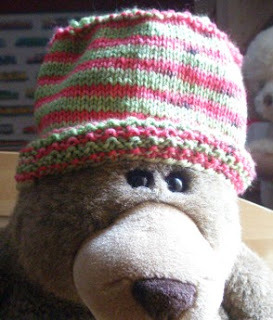 Hi I want to make your hat but just wondering what ply your yarn is? Midnight_girl, I'm pretty sure the ply was 3, but the weight is pretty close to Aran. The yarn I used is discontinued now but if you can get gauge with a nice squishy yarn (mine was an especially elastic wool) you'll be fine.